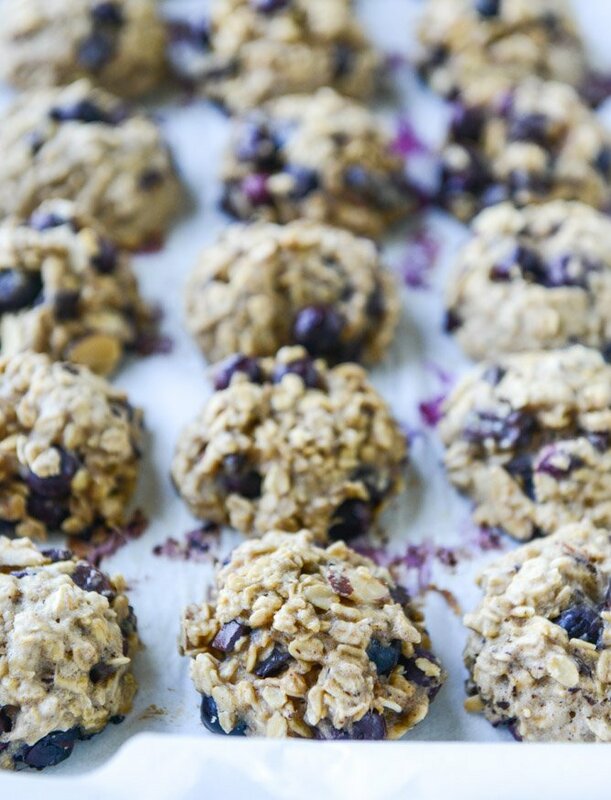 It’s not like we need an excuse to have cookies for breakfast… but I’m giving you one anyway. Just tag the word “breakfast” on the front and you’re good to go. Automatic health food! Breakfast DONUTS. 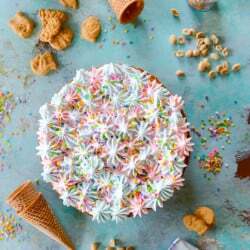 Breakfast CAKE. Breakfast cheeseburger? Breakfast pizza? I love how the world works. LOOK at all that goodness. I first made some breakfast cookies a few years ago, but these ones here are based on a recipe in Seriously Delish. The ones in the book have lots of figs and dark chocolate, so I kept the chocolate (obviously) and threw in some blueberries. And used a little buttermilk! It’s like another cookie muffin hybrid thing. It gives you an excuse to have another one when you totally don’t need another one. I’m currently in a major savory breakfast phase – I don’t want pancakes or french toast or cinnamon rolls or pastries. I’m half lying because I ended up with pancakes for dinner last night but that was more out of desperation than anything else. SO. I just want things like eggs benedict and loaded breakfast sandwiches and every slice of bacon that exists. But! Since I don’t have tons of time at the moment, I’m living on things like these. Breakfast cookies should really translate to “anytime” cookies because I’m also eating them for lunch and snacks and maaaaaybe in the middle of the night. P.S. if you’re a nursing mom you can totally add some brewers yeast and turn them into cookies like these. AND the best part is that they are the perfect complement to iced coffee. Which I currently need an IV of. Just please inject it into my veins? In a large bowl, whisk together the oats, flour, flaxseed, sugar, baking powder, baking soda, cinnamon and salt. In a smaller bowl, mix together the mashed bananas, egg, coconut oil, butter, vanilla extract and buttermilk. Add the wet ingredients to the dry and mix them until just combined. Stir in the blueberries, almonds and the chocolate until they are evenly dispersed. Scoop out the dough 2 tablespoons at a time and place it on a nonstick baking sheet, keeping the cookies 2 inches apart from each other. Bake for 12 to 15 minutes, then remove the sheet from the oven and let the cookies cool on the baking sheet. These cookies are best when eaten the first or second day, but can be stored in a sealed bag or container for up to 5 days. I even like them stored in the fridge and you can freeze the dough ahead of time too. I suggest scooping out the cookies and freezing like that. Bake at the same temperature for a minute or so longer if frozen. We can justify all things together. What can I use as a substitute for the bananas? Another solid recipe! You should start putting a star rating on your recipes, because they are so reliable, delicious, and well thought out. i made this recipe almost exactly as written, substituting the chopped chocolate with an extra 1/2 cup blueberries. Oh, and I also sprinkled turbinado sugar over the tops. I think the recipe made 22, but it’s hard to tell because we immediately ate a bunch. I put them in the freezer to grab as a breakfast or snack to go. Thank you! Can you tell me a substitute for egg.. 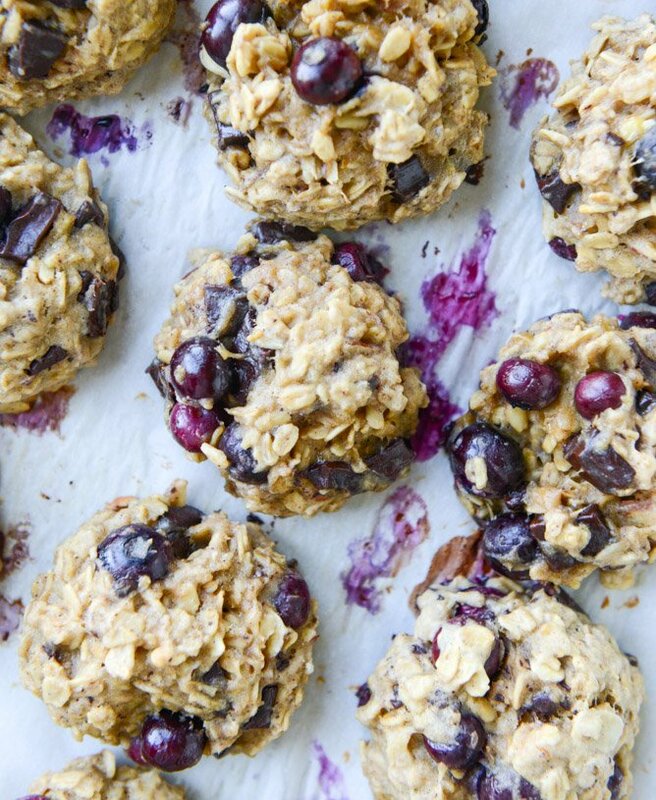 I love blueberries but I do not think I have ever had them in a cookie! This is a totally unusual recipe idea. Just tried this without the chocolate and it turned out ok. I tried to substitute the chocolate with blueberry chia seed rosemary jam, but it didn’t do the trick. I also used gluten free flower and left out the baking soda (didn’t have any) and used soy milk instead of buttermilk, and no coconut oil (didn’t have any). Will definitely try again (with chocolate)! I’m pretty curious about how it would turn out with some craisins and macadamia nuts! Love your recipes!!! Cookies for breakfast?! I’m in! These look so good! 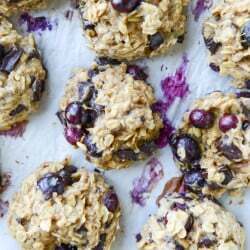 These look amazing and I would love to turn them into lactation cookies with some Brewers yeast! How much would you recommend adding? I noticed there are 5 Tbsp in your other lactation cookie recipe; do you think that’s a good amount? Thank you! Would love to know a substitute for bananas in this recipe! Applesauce? Thanks! Me too can’t have banana s in our house. Applesauce or pumpkin I would think. 1/2 cup? Could you use frozen blueberries? And could use chocolate chips? These were awesome! I took a bunch to eat on a plane, which was great because they are small an easily packed, but very satisfying. I used dried blueberries rather than fresh as I was worried that fresh would be too runny and wet. The dried berries absorbed a bit of moisture while cooking, and plumped up. I will be making these again for sure! Very tasty and totally worth eating for breakfast (or any time really). I didn’t have coconut oil on hand and so I just used butter. The cookies turned out well and I’m looking forward to having them for breakfast this week! Would you please adapt this wonderful recipe so we could bake it in one dish and then cut into squares? What can I use to place buttermilk lactose?